The 2018 Jaguar E-Pace just had a test drive test and it passed easily. It has an Easter egg painted onto the bottom left corner of its windshield. It depicts a Jaguar with a cub. Cute. It’s supposed to resemble the model’s role as Jaguar’s baby SUV to the larger F-Pace. The only problem is, they’re different models. Although the two look similar — and are gorgeous for SUVs are concerned — a full examination reveals it’s all a façade. The F-Pace chassis is built on one that’s also used by Jaguar’s sedans and the Range Rover Velar, but the E-Pace is kin to the Range Rover Evoque. The F-Pace platform is primarily rear-wheel-drive, while the E-Pace front-wheel-drive. There’s no missing link between them, the vehicles are totally different. But they do have a few things in common. Both of them, actually. 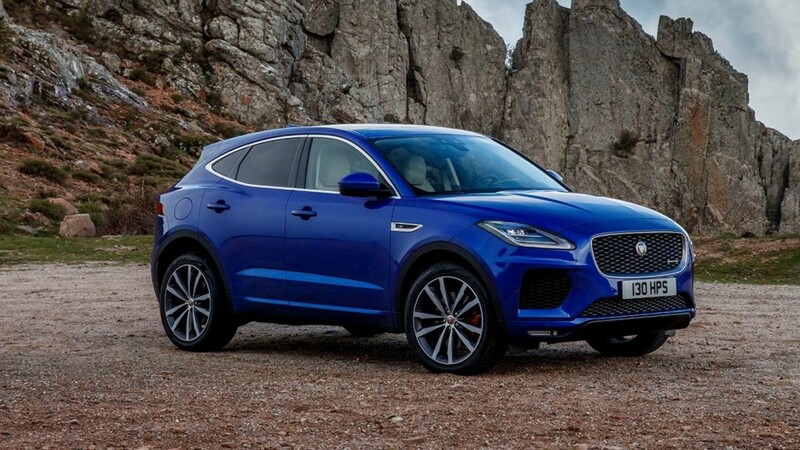 They’re 2.0-liter four-cylinder engines, that produces 247 hp and 296 hp, and are the only ones offered in the E-Pace, while the F-Pace has a choice of supercharged V6 and V8 engines, not to mention a diesel. But the stronger version does the trick in both of these urban jungle cats. It’s more reliable and a good value proposition in the F-Pace, and turns the little E-Pace into something of a muscle SUV. You’ll find it bundled in the R-Dynamic trim level, which starts at $47,395, an increase from the E-Pace’s starting price of $39,595. But you get more than power. All USA-bound E-Paces have standard all-wheel-drive, and the R-Dynamic adds leather upholstery, automatic emergency brakes and built-in WiFi. Available options run the table from a 360-degree camera to adaptive cruise control and a full panoramic sunroof. However, Apple CarPlay and Android Auto smartphone integration costs $300 for both, because they are necessities given Jaguar’s so-so native infotainment system. Overall, it’s not hard to pay more than $60,000, which is a lot for a small SUV, but in line with Jaguar’s luxury competitors. In keeping with its mixed heritage, the E-Pace features interior styling that resembles the Jaguar’s F-Type sports car. What stands out is it’s pistol grip gear shifter and the grab handle on the center console for the front passenger, but also the overall style of the design and materials. It’s not glitzy and glamorous, but the look is sporty and unique. On the functionality end, rear legroom is limited and the seatbacks don’t fold perfectly flat, which makes it hard to get the most out of the cargo space. But there’s lots of it, despite the sloping hatchback. As far as the ride is concerned, I have to tell you that my first few miles behind the wheel were a little disappointing, but only because I’d literally just stepped out of Jaguar’s new battery-powered I-Pace SUV. It’s about the same size as the E-Pace, but its seamless electric drive and supple air suspension system make it feel old. Once I readjusted, the E-Pace revealed a solid blend of comfort, handling and response. It’s not the pure magic you get in premier Jaguars, but even with the 20-inch wheels and thin tires that the top of the line R-Dynamic HSE rides on it’s never too rough, the steering is smooth and the engine makes highway merges a breeze. And while you likely won’t see too many E-Paces intentionally going off the beaten path, those Range Rover bones give it some light off-road chops and the ability to wade through 20-inch-deep water. All things to take into account, that Easter Egg is just as much about E-Pace customers as it is about the vehicle, depicting Jaguar’s hope that newcomers who buy this entry-level model will grow with the brand. But that only works if their initial experience is a good one.